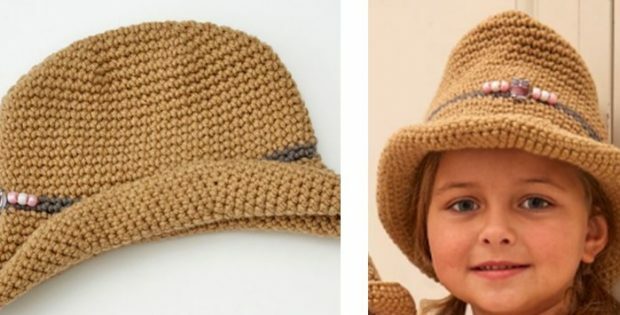 This stylish child’s crocheted cowgirl hat is perfect for a child who loves the ranch and dreams of being a country music star. Your little one will surely love this hat that is so stylish and chic! A rewarding crochet project for intermediate to expert level crocheters. Once completed, the stylish crocheted hat should measure approx. 20 inches head circumference. In metric measurements, the finished crocheted cowgirl hat should be about 51 head circumference. The stylish cowgirl hat pattern also includes a 1-inch decorative button or bead or pony bead for added accent to the hat. Designer Rebecca J. Venton over at Red Heart created this adorable looking cowgirl hat. In fact, you can access the FREE downloadable crochet pattern for this pretty cowgirl hat from Red Heart. To access the FREE downloadable crochet pattern for this stylish cowgirl hat please click here: Stylish Child’s Cowgirl Hat Pattern. Featured image(s): Red Heart, thank you! Hi there it’s me, I am also visiting this site daily, this website is really pleasant and the visitors are genuinely sharing pleasant thoughts.